Hall of Fame jockey Victor Espinoza was back at Del Mar Saturday for the first time since incurring a fractured vertebra and spinal cord trauma in a training accident here on July 22. 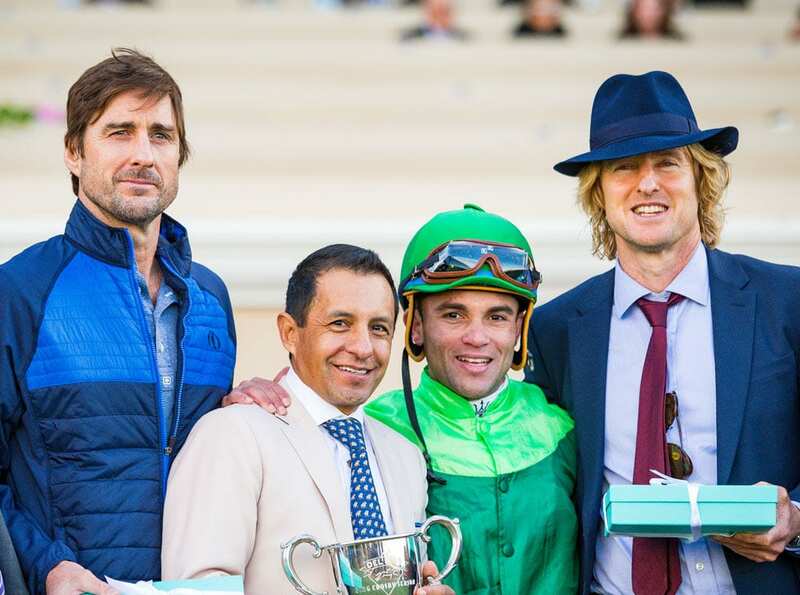 The official duties for Espinoza were to present the trophy to the winner of the Grade I $300,000 Hollywood Derby – which he did to owner Peter Brant and jockey Joel Rosario of Raging Bull with A-list acting brothers Luke and Owen Wilson alongside. Before and after the ceremony, however, Espinoza used the occasion to provide some good news to fans, horsemen and followers. “My body is getting stronger day by day,” said Espinoza, whose initial treatment was done at Scripps La Jolla and who has been recuperating at his Del Mar residence. “Last week I saw my doctor and they checked the MRI and it came out perfect. I was surprised but really happy. Everything is coming along well and I don't need surgery, which is great. My spinal cord has healed perfectly fine, which was my main concern. This entry was posted in NL Article, People and tagged Del Mar, fractured vertebrae, hall of fame, hollywood derby, jockey, jockey injury, MRI, santa anita, spinal cord, Victor Espinoza by Del Mar Thoroughbred Club. Bookmark the permalink.